After graduating from Castleton in 2013, alumni Nathan Ellsworth reflected on his time spent in the Business department, majoring in Business Administration with concentrations in Management and Marketing. “I gained valuable connections for my career as well as endless amounts of feedback and support from the professors and my classmates working together to accomplish a common goal,” Ellsworth said. Looking back Ellsworth said he values the high level of communication between professors and students. Thanks to his advisor and professors, Ellsworth received great career advice throughout his time as a student and had an encouraging learning experience within classroom. “There was never a time, regardless of the hour, that I could not receive a thoughtful answer for any question I had,” he said. Ellsworth now has a successful career, holding a Manager position at Jasmin Auto. However, one thing he will never forget is the great atmosphere and people Castleton has to offer. 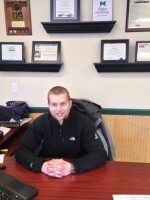 “I enjoyed my entire experience as a Business student and truly appreciate the time I spent at Castleton, "he said.